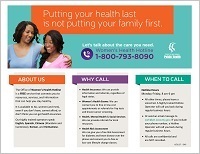 The Office of Women's Health encourages women, especially mothers, to keep their health a priority. We want women to remember that is it critical to make their own health a priority so they can be there for their loved ones in the years to come. Women who "do it all" sometimes put their own health last, which places them at risk for undiagnosed heart disease, cancer, and many other health conditions.